The Gestetner 3225 digital imaging system is an all-in-one solution, a low to mid volume copier, network capable printer and full-featured fax. This multi-function unit performs at near-top speeds and incredible efficiency and is capable of fulfilling some of the most demanding print jobs. It is fully customizable, with a wide range of robust upgrade products that will suit virtually any medium-to-large office paper processing demand. 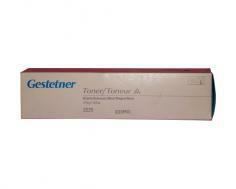 The Gestetner 3225 has a maximum printing speed of 25 pages per minute on a drum that has a 45,000 page yield. 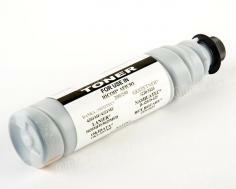 Resolution is at 400 dots per inch for copying and 600 dots per inch for printing. Copy size can be reduced to 25% of the original size and expanded to up to 400%. The unit's firmware can be configured for automatic magnification to fit the desired output copy page size, making certain higher-volume copy jobs easy and convenient to set up. A 2-on-1 combine mode, accessed through a dedicated LCD touch screen, makes it possible to shrink and combine 2 scanned documents onto one piece of paper to save time and cost of materials. This unit also comes standard with electronic sorting for intelligently and efficiently collating multiple-page, multiple-quantity print projects into stacks that can be easily separated. An auto tray select feature will automatically select the best page size based on the size of the original document being copied. Center and border erase features eliminate blank spaces on original scanned documents and help utilize every bit of output page space. The Gestetner 3225 has excellent paper handling capabilities, with two 500 sheet trays coming stock with the copier, in addition to a single 250 sheet tray, which combined will hold almost three reams of paper at once. Upgradable options can expand the unit's total potential paper holding capacity to 2,850 sheets, more than double the amount that can be held with the standard number of trays that come with the unit out-of-box. Standard text document and business letter copying and printing are accomplished with ease, speed and professional quality, which is primarily what this machine is specifically designed for. The Gestetner 3225 comes equipped with 50 programmable user codes to provide security throughout office departments and for individuals from entry to executive level. Job programming enables users to load and save settings for jobs that are repeated on a frequent basis, significantly reducing setup and planning time, freeing a person to do other things. A negative/Positive option permits a user to reverse the black and white contrasts of a document which has content that may be difficult to read or decipher in its original form, such as documents archived on microfilm and old newspaper clippings. All around, it is hard to surpass the Gestetner 3225 in versatility, reliability, convenience or paper handling capabilities, putting this machine at the top of its class. An increase of resolution to 600 dots per inch will significantly affect overall printing speed, as the top speed of 25 pages per minute is only at the 400 dpi setting. If you wish to copy images rather than just text documents, image quality suffers with a limited 256-levels of grayscale printing. The fax speed of the Gestetner 3225 is slightly slower than average, mainly due to a non-upgradeable 14.4 Kbps modem. The speed is slightly increased by creative use of onboard memory but it is still a little behind other fax machines that can typically transmit at 33.6 Kbps. 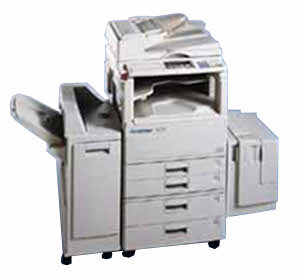 Being another example of a printer/copier that is designed for and targeted to medium and large office needs, it is extremely expensive and impractical for small business and home use, as its capabilities would far exceed jobs that require small volume of output and less frequent use. 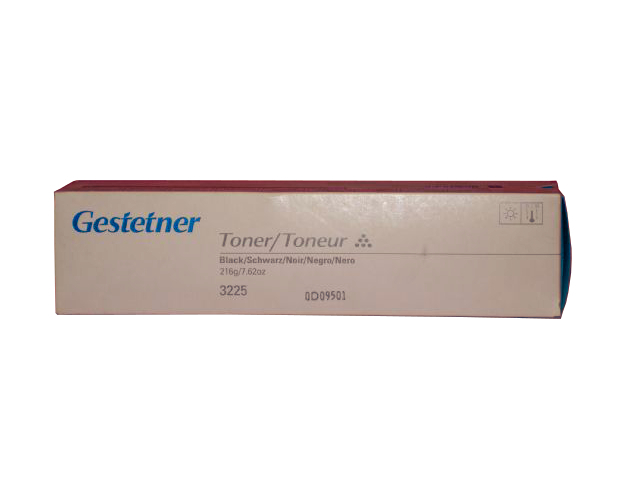 Review it: "Gestetner 3225 "
High yield toner cartridges come in black only, with a maximum yield of 8,000 pages, and are easily available at most supplier outlets. Cartridge costs are relatively low compared to those of other, comparable models, and come in OEM and OEM-compatible varieties.